Do you own a shop or need to haul around loads of packages? Then you know how vital a hand truck is to prevent you hurting your back. The two-wheeler has a compact design that folds away for storage and great to take hand trucks with you anywhere even on vacation. The stack truck offers you maneuverability and makes backbreaking tasks simpler. Not only can you use the hand dolly for moving around large items, but you can also use them to shift loads of smaller things at the same time. We have sifted through the best trolley trucks and compiled a list of the top 10 hand trucks in 2019 for you to use. For a folding hand, truck look at the Magna Cart to move items around at home and your shop. The hand dolly has a red and silver design with telescoping TPR handle and extends to 40-inches in height. The frame has a durable steel structure and can hold up to 160 lbs. The 5-inch rubber wheels retractable and include a bungee cord. When folded it has a compact 28-inch tall and 2.5-inch wide size. Magna backs the product with a year warranty. The Benhe looks like a giant shopping cart and holds loads of boxes at the same time. 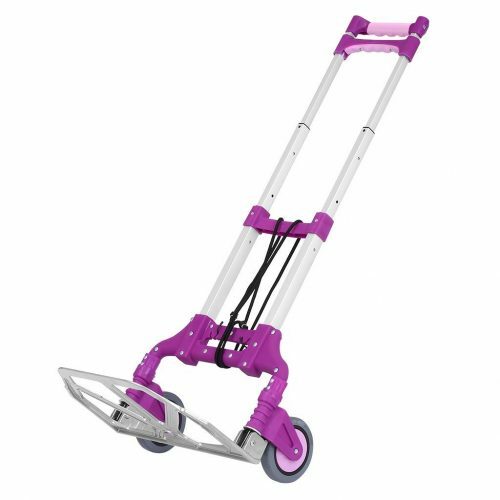 The hand truck has an aluminum design and great to use at home or in the office. The handle extends to 39-inches high and folds flat to 2.5-inches for storage. The cart has PU wheels with a 4.7-inch size to bear heavy-duty loads. You receive a bungee cord included to place around items to keep them secure while in transport. The color is blue and fits in with any décor. 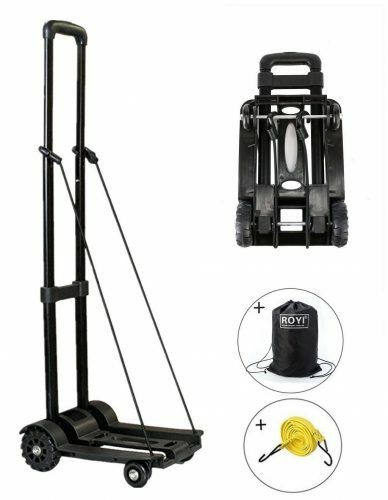 The ROYI hand truck folds up for storage and has a lightweight 4 lbs design. After use, you can place it in your backpack on travels. The handle extends, and the drawbar has a steel structure and holds up to 155 lbs. You can haul small to large items on the base plate made of plastic. You receive a bungee cord included, and the cart has four wheels that rotate for moving. Whether you are traveling, doing shopping, a student or more the hand dolly is perfect to carry anything. Another durable and affordable hand truck is the Finether Cart. The stack truck has an aluminum framework and holds up to 176 lbs. The crossbars fixed between upright tubes for stability and the PVC wheels will not damage floors. The telescopic handle extends to 39.5-inches to haul around high loads. The base plate is large and made of aluminum alloy. Included is a 4.9 feet bungee cord and it opens and closes quickly. There is a lock release bar to extend the handle. The truck dolly folds to a 25.2-inch tall and 2-inch thick size. You can buy the cart in assorted colors to suit your lifestyle. For one if, you need the traditional hand truck from yesteryears looks at the Magna Cart. The two-wheeler has a black and red color design with aluminum material and folds away for storage. The handle extends to 39-inches and has a 15-inch broad aluminum base. The 5-inch rubber wheels need no air and transport up to 150 lbs. You can use it at home, the office, or in retail. You can even use it with the Magna Cart MT3 collapsible storage tote. The Welcom MC2S Elite from Magna Cart stands 39-inches tall when the handles extended and fold up to a compact size. For the frequent traveler, small businesses, and show exhibitors the hand trucks perfect. The base supports up to 200 pounds and when not loaded it only weighs 10.5 pounds. The rubber wheels measure 5-inches and need no air. 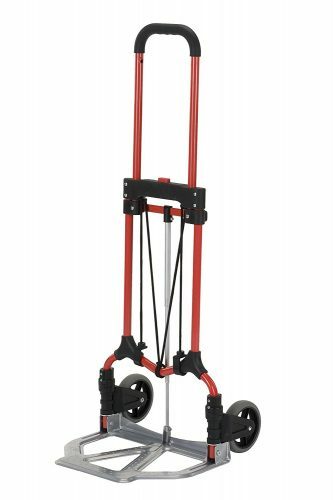 The Milwaukee hand truck you can use indoors and outdoors with the 8-inch Tuff rubber tires. The load rating is up to 600 pounds, and it has a flow back handle with tubular steel frame. The toe plate measures 8 x 14-inches. The stacking height is up to 42-inches, and the hub has a polymer structure with 2 – ¼ -inch offset. The beautiful thing is the tires puncture proof and great to use with one or two hands. Three cross straps are offering a secure fixture to prevent items from falling through. You receive a one-year warranty. 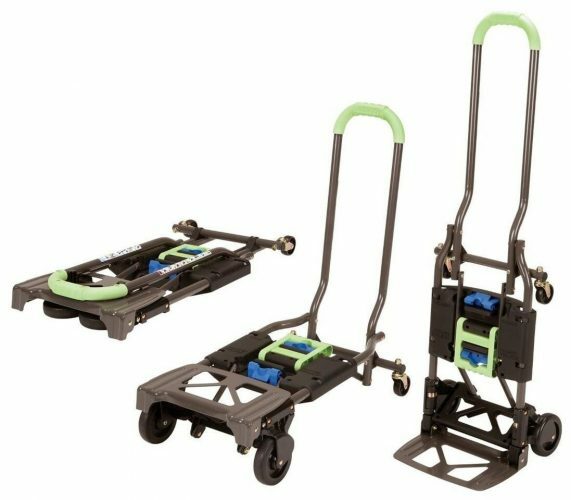 For a compact and foldable hand truck, you need the Wellmax pushcart dolly model. The padded handle folds down and lays flush with the platform to stowaway. The four-wheel design helps to make moving around items easier and smoother. The wheels swivel 360° to help to maneuver around corners easier. The maximum load weight is 660 lbs and has a custom support guard to prevent boxes from slipping backward. 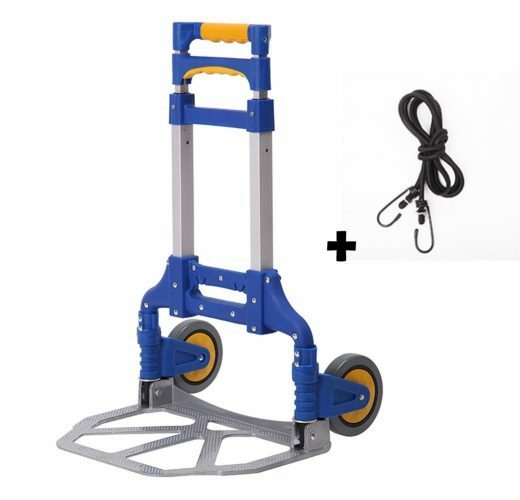 The Cosco Shifter is a multi-position heavy-duty hand truck that folds away for storage. Converting it from closed to open is quick and needs no additional tools. You can use it as a two-wheel truck upright truck or turn it into a four-wheel cart. The frame is durable, made of steel, holds up to 300 pounds, and comes with a five-year warranty. When folded the hand truck weighs 15-pounds. 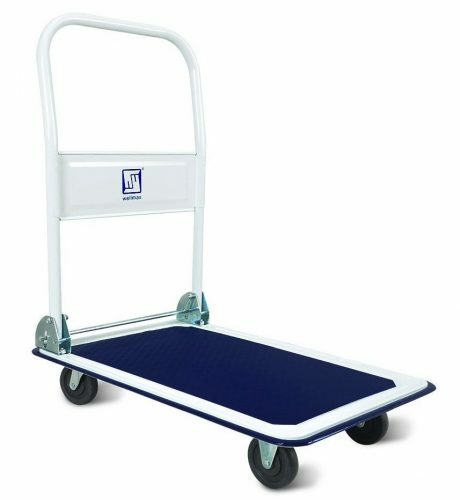 The Magliner hand truck has an aluminum straight back frame with a vertical loop handle. The nose plate has a diecast aluminum structure, and the wheels measure 8-inches. The moving handcart can transport up to 500 pounds, and the wheels comprise of semi-precision bearings. You do need to assemble the dolly and include the instructions and hardware. 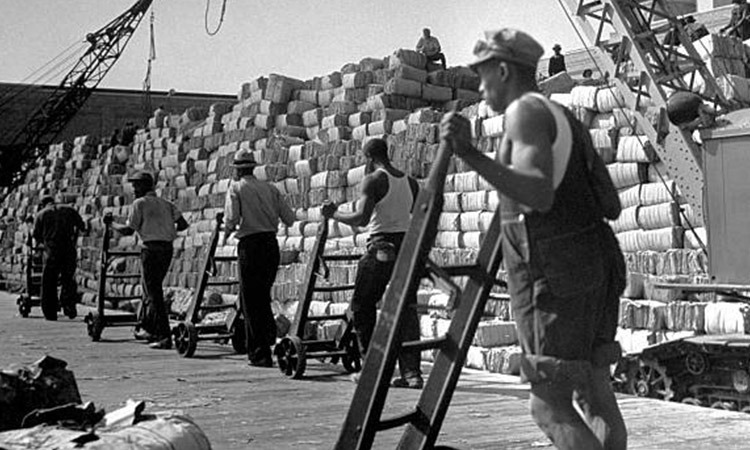 Why break your back in carrying loads of boxes from one place to another. 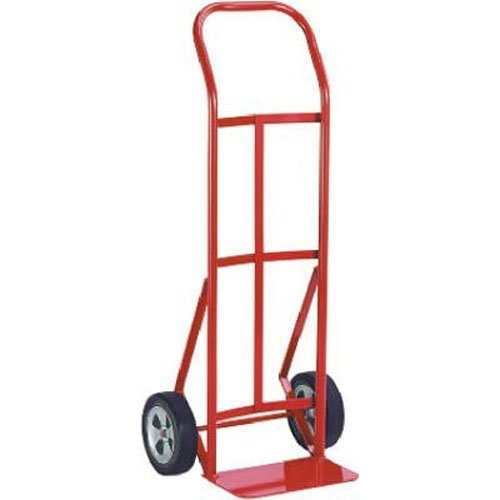 With our top 10 hand trucks you can buy in 2019 here you can move items easily. We have selected different hand dollies for you to look and decide whether it will work for your type of situation when in need of hauling goods. 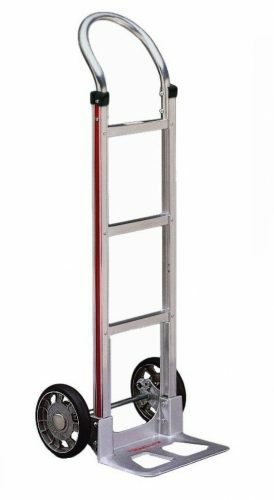 We feel confident that you will find the Cosco Shifter hand truck a great tool to have around the home or office. You can convert it into a hand truck and hand cart for multipurpose use.